Vibrant, unconventional and boasting a classic vintage glamour defines this 21 storey glass skyscraper in Cardiff. Something old, something new, something borrowed something Blu; the Radisson towers well above it's rivals. Looking for something a little sophisticated? A little luxurious? A little stylish? Then you’ve come to the right place. 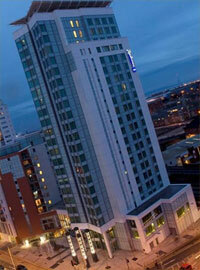 And though we could be talking about the Room4U site, we are actually talking about the unrivalled Radisson Blu Hotel. If you thought the term ‘iconic’ was reserved exclusively for movie stars and enduring fast food chains outlets and soft-drinks then you clearly haven’t come across this stunning 4-star hotel in the Welsh capital – an eye-catching 21 storey glass ‘skyscraper’ that offers a panoramic and almost implausible view of the city. To get a real appreciation of the uber-stylish ‘Blu’ brand its worth checking out the pictures on the link below but just to give you a taste of what’s on offer, get this: the hotel features 215 rooms spread over 21 floors, including 60 Business Class rooms and 12 luxury suites – all offering tremendous views of the city.